This is a real treasure and quite a serendipitous find. I was going through a box of my fathers collections of family type papers. What caught my attention was Geburtstag at the top of the paper. My limited knowledge of German told me it was a list of birthdays. Vater und Mutter written in the Old German Script. What I had found, and never knew of its existence was a hand written note circa late 1920’s. My theory was that it was written by my great grandmother Anna Meta Margarita Hackmann. My theory was that it is usually a woman who knows such things as birthdays. The latest date that I can see is 1929. My grandfather and grandmother (Willi Schridde and Anna Bartels) had emigrated in 1926 and it has listed the names of his sisters, their spouses and children, as well as their birthdays. The writing on the lower half of the second page is that of my grandmother, which I had recognized as hers. From this, with a little help of my friends I was able to find Anna’s parents (Ernst Freiderich Wilhelm Hackman and Elsie Marie Johanna Rettle, and Elsie’s mother Anna Meta Margarita Lurssen my my great great great grandmother. My hope is some descendents of the sisters of Willi will find my posts and get in contact with me. I tried to write the explanation with the picture but somehow it would not permit me to do that... Katharina RAUSCH Sperl Nosseck was born in Bohemia, which is located at the far western area of the Czech Republic. As you can see from the stone, her language was German. At the time she had emigrated Bohemia was a part of the Austro Hungarian Empire. She emigrated sometime circa 1882 and married Anton Sperl circa 1884. I have yet to find their marriage record. Anton died from Typhoid Fever in August of 1899, just a few months after his youngest son, John Christ Sperl was born. John was my husbands grandfather. In 1904 Katharine married Jospeh Nosseck and they had two daughters, Caroline and Josephing. Joseph was previsously married two times. The first is unknown to me and the second was Katie Stross who died sometime between 1900 and 1904, have yet to find her records. In my family there are eleven offspring of six siblings. This Christmas two of the nephews have become engaged. That leaves nine to go. It is funny to me that the guys all have steady girls friends and the gals do not.......The breakdown is seven females and four males. The daughter said it was because all the girls were busy going to school, this could possible be correct because they are in post bachelor education. I told the one bride to be that I would have to add her to the family tree.. When I was a child Christmas Eve was pretty uneventful. What I remember was my mother preparing for Christmas Day. We really did not go anywhere, at least not that I remember. When I met Chuck I was delighted that his family celebrated Christmas Eve. We always got there early and waited for his chronically late brother to arrive. We would eat cold cuts with cheese in sandwiches. Perhaps a side dish or two. I would make cookies to take alone and possibly a cake. After we ate and it was then close to midnight we would open the gifts and then drive home in the wee hours, it was only a half hour drive. The roads we quite still and we would go to bed and wake up to go to my moms for dinner. I miss the Christmas Eve get together, and wish we had a celebration and tradition like the Italian traditions of the Seven Fishes. I went to my sisters one Christmas and enjoyed the fish tradition. Did I decorate the graves. Yes, and it was quite a project. First I had to buy the flowers, no problem there. Then after a consultation with my sister, she fed the metal wires through the stems and told me I had to feed the wire and stems into the vase, then wind them around the bottom stem of the vase. Sounded easy enough. She also said I had to find the tiny holes to slip the wire through. This proved to be not a job for anyone who wears bifocals. I was able to do that on my fathers vase, but on my mothers vase I could not SEE the hole to thread the wire. So, what I had to do was bring the wire up from the stems and try to wind it around the outside of the vase. By now my knew were wet and dirty and I said "Sorry Mom" I have a suspicion that those flowers will get blown away. I do not know how to solve this problem, but I need a warm, dry day, which is not happening anytime soon. BAH HUMBUG. ]I will try to make this a twofer. The first question was did you attend a religious celebration. Yes, we always went to Mass on Christmas and every Sunday. It was always so exciting because we were little and the church was ablaze with candles and the altar was teeming with flowers. In one of the side alcoves there was the Nativity Scene, with rather large statues. They looked life size to me at the time, but I do not know how large they really were. It was always a High Mass, which means there was a lot of singing. I can remember GREGORIAN CHANT MUSIC and the scene of the incense that was wafting through the air. We always attended the earliest service possible, usually 6 AM, but sometimes we went at 8 AM. I do not know why they got up so early. Christmas Carols, the only time I have ever gone caroling was when I was in Nursing School and the students went to the LITTLE SISTERS OF THE POOR and sang there for what seems to be a long time. The seniors enjoyed the singing and it brought tears to a few eyes, including our own. I do not have anything to post about concerning black sheep relatives. I am not saying they were perfect, I am saying I haven’t found them yet. I did hear, but not documented, from my father that my great father Patrick O’Rourke had participated in the HOMESTEAD STEEL STRIKE When my father talked about it he only said that Patrick never worked for the steel industry again, and he spent his days as a street sweeper for the local borough. He would have been forty at the time. Dad also said that his grandfather was “miserable” and “mean” and he had quote him by saying “It is better to be a dead lion than a live jackass.” There was a lot of bitterness in the man, and probably rightly so. Patrick lived to the ripe old age of seventy seven. Now, is this a kids perspective? But my grandmother Gertrude O’Rourke said he father was mean and angry at everyone at the time. It would be demoralizing to lose your job in the prime of life and have a eight children to feed. At that time big business did not care about their employees and whether they lived or died. Looking at the conditions today I do not think anything has changed, just the bonuses have gotten ridiculously out of proportion to the rest of the salaries. I seriously doubt if then, as well as now, the CEO’s have any idea of the lives of their employees and the suffering they caused, on the other hand they do not care. I have no idea when my parents started Christmas Shopping. After I had gotten married I know my mother would start after Thanksgiving. When we were first married I had usually took the first week in December and did my shopping then. But now the list is so short that I can do it on my days off and weekends (but I have to be sure to get out there early) There are just a few things left to buy, so maybe tomorrow morning I will be out and about. I have been up since I heard my husband scraping of the car windshield as he was going to work, or rather, getting the car ready to go. It is snowing and there are about four inches outside. What did our ancestors do when it snowed? Did they walk to work? Since they would have been working in the year 1900 they would not have had a car. I suppose there were trolleys or did everyone live near their place of employment? Some things that were so common sometimes are off our own radar.. I would really like to have spent a day with each family of mine to see what a typical day was really like. I wonder what it will be like one hundred ten years from now and what will my descendants life be like? Now that is a thought to be pondered.....I imagine the future will be entirely different than we could ever imagine, just as the future was for our great grandparents. Did I have a stocking?? NO, I think it was because there was not much money. We were lucky we got gifts. And thanks to my grandmother, Anna Maria Johanna Bartels, we had gifts. My daughter has a stocking, which I habitually forget to buy things and run around thinking what will I put in the stocking. So if Emily reads this, what is coming are gift cards. They're small but mighty. Grab bags. When my sibs and I got older we would put names in and draw them for Christmas, but that proved to be expensive. Then we did the children, but most of them are grown up and a few out of college. Every month I get together with some of my friends and we eat, have a glass of wine or two and chat. This January we will get together and celebrate Christmas. We decided we were too busy in December. So, the procedure is such, you buy a gift for the cost of $20, then you pick one of them. If the next person decides they like your gift it is still up for grabs. I do not know how it ends but I will post on it in January. Sounds like fun, think I will get a bottle of Reisling. I was in a Christmas Play. I had forgotten all about that. I went to a Catholic Grade School from 1st to 8th grade. One year, I can not remember except that it was early elementary, and I think perhaps 1st grade I was an angel. I think this was because I was the most petite person in the class. I remember that my line was "Hark, I bring you tidings of great joy"
In the second grade I had the honor of drawing the Nativity Scene on the black board. I was always good in art so I suppose that is how I was selected. I had a picture and drew it from the card. It looked good at the time, I would like to know know how it really looked with my adult perspective. I still like art, and paint in watercolors, although I haven't done that for awhile and I also like photography. I do that a lot. Are there any occasions or anniversaries coinciding with the Holiday Season? Well the first would be my and Chucks wedding anniversary, which is December 4th 1971. I asked him if he wanted an summer or winter wedding and told him when to show up. The second thing that I have found is his great grandmother Olive Bauser Stephens Rauhut's death, which was on Christmas Eve in 1923. It took a few months but I managed, with the help of a kind soul on Allegheny County Roots Web, found that what my Aunt Edna said was true, Olive did indeed die on Christmas Eve. After someone found the death certificate on the Ohio site, she was buried in December 27, 1923. Can you imagine how everyone felt, each and every Christmas they would think how mom died on Christmas Eve. That is really depressing, I found it depressing eighty one years later. I suppose that I should contact the cemetery to see if there is a memorial stone. Fruit cake????? Do people really eat that? Did we travel anywhere???? NO, there was no where to go. My dad would bring my grandmother to our house. My mother was an only child and my fathers only brother died in 1951. He had told us all that we didn’t have any relatives, with the exception of a few aunts, and I found out recently that there were a lot. I am wondering now if Gertrude did not associate at all with her husbands siblings? I have a feeling that there is more than meets the eye, and I probably never find out. Cheating????? The only “cheating” I can associate with Christmas, and I had totally forgotten was my parents would celebrate Christmas on December 24th. Their reason was that the kids would not want to go to church once they started playing with their toys. It was done by telling the unsuspecting sibling that December 24th was Christmas. They were so busy playing that they never went outside to compare findings with the neighbors. Today, with all the instant electronic communications, they would have never been able to pull it off. I will have to ask the sibs if they remember that??? I had long forgotten, but the title of the Advent Calendar made me remember. I was reading some of my favorite blogs when I came upon Blog Anniversary Dates in GENEABLOGGERS. I thought my date should be coming up soon and so I checked….. I love reading others blogs, it gives me inspiration, where and how to research and just ideas on what to write about. I have been working on Genealogy for three years now and I must say I have found more and gotten farther than I would have thought to be possible. My biggest regret would be I did not start it sooner and gotten information from my parents or grandparents. Some one posed a question to me one day. If you could have dinner with anyone throughout history, who would it be? My initial answer was Thomas Jefferson, but now it would be my great grandparents. There would be so much to find out. I would love to talk to the people who came before me and who genes made me who I am today. Today I had a demonstration and a tutorial on placement of flowers in the cemetery vase. My sister said she read my blog and had to give me a call. She did wire the flowers in the vase, it begins with very fine wire and you have to weave the wire thru the stems of your flowers. The second step is to place the wires thru the little holes at the bottom of the vase and then wind the ends around the stem at the base of the holder. She said that the flowers will blow away and the wiring help to prevent someone from taking the decorations. Hard to believe that some one would take decorations from a grave. The question was did your family do volunteer work at Christmas. The answer is No. I think my parents were busy trying to eke a life of their own. My parents had given money to the church but other than that I do not think there was any to give. I know later, after we were gone he and my mother gave money to organizations but never got involved in volunteering. I think my father had social anxiety disorder, it there is such a thing. He was always uncomfortable with people other than his family and people at work. My family celebrated the usual traditions. But I do have another tradition story. When my daughter was in first grade the community had a large Jewish population. In the holdiay season they learned of the traditions of Judaism and Christian. She came home one day and told me she wanted to celebrate Hanaukkah. I told her to go ahead and celebrate what she wanted but I was not going to give her nine presents. I thought it was a good idea that they would be taught about other beliefs, celebrations and customs. Happy Hanukkah to those who's celebration starts tonight. What was the favorite gift I have received? I honestly do not know......I like things that are a total surprise. Something you would like and would not buy for yourself. At first we bought gifts for everyone in the family, that proved to be too expensive, especially with the addition of family members. Then we tried a Christmas grab bag and that worked for a while, but also got too expensive. Now we just get little things. Last year I gave my sibs a copy of a picture my sister in law had taken of the six of us. Some times you will get pictures, ornaments or some tasty food item. I think what I like the best is the company of my family and just getting together for dinner, and sharing the time. Write about what I remember. We grew up poor, but we didn’t know it. When my mother was very sick and at the last day she went to her oncologist she was talking about her mother. 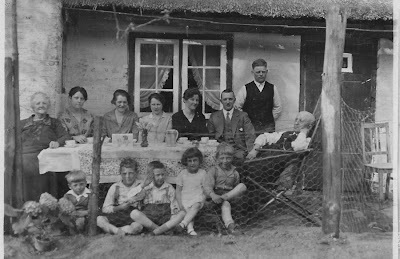 Gerda said that the only way we had presents at Christmas was because her mother gave her money to buy presents for the kids. My father did not want to take any sort of help from his mother in law, I guess he was too proud to take any help. But my grandmother buying presents was for the children. Gerda said if she had not done that we would have not had any Christmas. At Christmas we each got one larger present and perhaps two smaller ones. One Christmas I got a bicycle and I had always wondered where they kept that bike till Christmas morning. A big disappointment for me one year was that my grandmother Gertrude asked what I wanted, and I had my eye on a Terri Lee Doll because the girl next door had one. Gertrude said OK, I was in little girl heaven. On Christmas I was waiting with anticipatory joy, and what she bought was a Madame Alexander Doll. Now this doll looked like an adult and not like the child figure I had wanted. I then noticed that anything I told Gertrude I had wanted was not to be believed, she bought what she wanted. In spite of that I managed to survive. It took me a long time to go and take these pictures. I guess I had to resolve the issues of my parents dying. Last Saturday I went and took the camera and took the pictures. My father saw a tombstone in one of the cemeteries on Ocracoke Island and he like the inscription and decided to put it on my mothers tombstone. I had mentioned in an earlier posting about the brown sugar cookies that I had loved as a child. My mother got the recipe from the little old lady who lived across the street from my mother. Beat egg at high speed until is thick and creamy. Add sugar and vanilla until smooth. Stir in flour, salt and soda. Then mix in the walnuts. Drop by teaspoon full on greased cookie sheet. Bake at 350 for ten minutes. Makes about 2 dozen. Remove and cool on cookie sheet then ice. THERE IS NO BUTTER, MARGARINE OR OTHER FAT IN THIS RECIPE. I can honestly say that my parents never had a Christmas Party, or one of any other kind to be exact. When I was a child we would go to my grandmother Gertrude O’Rourke Dowd house and she would cook. I can only remember doing this once or twice. I suppose she was getting older and the task moved to the next generation, or perhaps, it was easier for my dad to go and chauffeur his mother than it was for him to take all the kids to grandmothers house. When I was school age my mother would cook Christmas Dinner. It was the same every year because they were reticent to change. Everything HAD to be the same way it was the year before. She would put the turkey in the oven late at night and the house would fill with the aroma of the roasting bird. I remember when we were first married we would go to Chucks parents home for Christmas Eve and my parents for Christmas dinner. When we moved back to Pittsburgh in 1989 or 1990 my mother decided she was not going to cook any more dinners and me and my sisters and brother took up the tradition. Then my dad would chauffeur my mom to the kids houses. The menu would include turkey, mashed potatoes, gravy, vegetables, cranberry sauce and the pies. Now that they are both gone, we still celebrate together, but the one doing the hosting cooks the turkey, stuffing and gravy and the other dishes are parceled out and it is much easier to do it that way. You just have to plan if you are the host, take the next day off. As he got older my father would not go out and we would take him a platter of food which he would reheat in the microwave. What I would like is a picture of my great grandfather Thomas Dowd and his wife, my great grandmother Bridget Naughton and their eight children. Their oldest son, my grandfather, died in 1921. If he had lived to a ripe old age I am sure there would be one. I have been in touch with other newly found cousins, but no one had offered to send me a picture. I feel really bad that I can not see what they look like. I would gladly share my photos with cousins I have yet to meet. I have two memories of Santa Claus. When I was little, I suppose about three or four at the most, my grandmother and mother took me into the big City of Pittsburgh. They were Christmas shopping, and I was going to see Santa. I do not remember if seeing Santa was the plan, but I do remember standing in a long line. Maybe I got bored or didn’t want to be there at all, but when it was my turn I did not talk to him or sit in his lap, I climbed under his chair…… I do not remember how my mom got me out from under the chair. Was I afraid of him? I think I was, but did not have the skills to tell my mother and grandmother of my fears. They were really angry that they had wasted their time. My second story is when my daughter was in first grade we live in a primarily Jewish community. We had moved from Texas to New Jersey. The public schools system had both the Jewish and Christian Holy Days scheduled to be off. In the school system they learned about the traditions of both faiths. She came home from school and told me she wanted to celebrate Hanukkah. I told her she could celebrate if she wished but I was not going to buy nine presents. My final words on that subject was “Don’t tell your cousins of your suspicions.” She never told her cousins and seemed to enjoy playing along with the adults. Most people in my neighbor hood decorate with Christmas lights. Most of them are tasteful but some are downright overdone. What I do at my house is candles in in the window. I actually have been keeping them in a closet so they can be put up early. The rest of the ornaments are kept in the attic and we somehow, never get the decorations down till the week of Christmas. We always manage to get it done by Christmas Eve. Chuck said that the tradition at his house was that Santa decorated the tree and outside of the house in addition to the delivery of the booty. I will tell a story about an incident from my mothers childhood Christmas Tree. I suppose it was circa 1926 because that is the year they arrived from Germany. My mutti said that her parents put up a tree and the German tradition was to put candles on the tree and then light them. Well, somehow the caught on fire and my grandfather threw the tree outside and avoided a catastrophe. She said that particular tradition was never done again. I suppose it originated before Christmas lights, and I suppose now candles use is gone forever. Christmas Cards. They do not really stand out in my memory. I remember my parents send them and we got some, but my mother did not display them prominently. However, Chuck said his parents always received about 100 cards and they hung them up by tape on the wrought iron railing that was on both side of the steps going up to the second floor. They kept them in a box and then the next year they would make sure everyone would get a card in return. Chuck remembers every year his parents would have a card and mentioned that the person had died during the current year. I send cards myself but only to family and a few friends who now live out of state. I think it is the cost of postage that limits the amount of cards that most people send. When Emily was little and in school I would take the best snap shot, make one of those family cards and send them to friends and family. I found that Aunt Edna and the grandparents saved them all. The ornaments we had were a lot of decorated glass balls. There were a lot that I suspected were from my mothers family. My dads mom would buy an ornament or two and add it to the collection. Some of them were hand painted and quite elaborate. Sadly the all were broken long ago. I remember the Christmas scenes painted on two sides. What we had was an electric train and miniature village. My father had three panels that were elevated and put together. The tree went in the corner and the train went in an oval, with the village set around the platform. There was a train station, houses, stores and a church; also a few trees to place around the houses. I am sure there must have been people,but I do not remember them being there. How I got my ornaments that I have now. When we were dating Chucks grandfather said that he would give his Christmas decoration to the first of the grandchildren that would get married. Chuck and I were the first and shortly thereafter we had several boxes of many decoration and glass balls. We no longer put those old ornaments on our tree because they are so fragile. I now have colorful, unbreakable ornaments. I had mentioned a few posting ago how my father was a pack rat and kept everything but the old Christmas decoration and aluminum tree, but, he kept a plethora of paper documentation from both his and my mothers family. He had started with his mothers family, O’Rourke. He has listed his grandmother Ellen. On many of their children it had listed her maiden name as Martel, and Martin. After researching I found that Martel was French and although there were some French in Ireland, they were Protestant. A man on the Limerick suggested that the name might be Mortell or Mortel, and these names were frequent in County Limerick. Indeed, that is where I found information. But the census of 1851 showed the family was living in England. Poverty and the famine had forced them to migrate. Ellen’s fathers name was Patrick and Catholic. I found the Patrick Mortel family in the 1851 census with Ellen 6 months old. I am 99.9% sure that they are my ancestors. He had his grandfather listed as Patrick and a brother John, one one of the childrens Baptismal Certificate it was listed as a brother James. It took me a while to figure out the sister Reagan. About one year ago a fellow researcher sent me an obit of Mary O’ROURKE Rogan, which listed her brother Patrick in Pittsburgh, parents Denis and Mary O’Rourke of Limerick, and a sister Mrs.William Collins of Limerick Ireland too. With that little tidbit I found out the parents name, where they lived and two sisters. What I am still searching is my 2x grandmother Mary last name, and the given name of Patricks sister Mrs. Collins. My father would have been vey interested in my discoveries. The thing I remember most was the baking of the cookies. My mother would bake dozens and store them for Christmas. One of my favorites was a brown sugar drop cookie and she would ice it with a powder sugar frosting. I have never seen a recipe for those, but, somewhere in my recipe box I have it written down. Perhaps I will post it this weekend when I conjure it out of it hiding place. My mother was German, but my favorite treat was made by the woman who lived next door. She was of Slovak ancestry and made the best nut and poppy seed rolls. She gave me the recipe and I made them faithfully, but not recently. I guess watching calories replaced the rolls. I will see if I can find them too. It was a traditional turkey, stuffing, mashed potatoes, gravy, cranberry sauce, vegetables and pumpkin pie. My mother also made the German red cabbage in which you cut the cabbage in slivers like for cole slaw and then cook it with a little water, cloves and a sliced apple. You have to cook it for about 20 to 30 minutes. I love it, I suppose it reminds me of my mother. Even thought it is December 2nd, I am behind as usual. My parents bought a live tree from a local tree stand. I never really paid attention, it just sort of showed up sometime in December. We had old (antique) ornaments that were of glass many were from Germany, and large light bulbs (the size that would fit in a night light) and they were inserted into a shaped, shiny star that had the finish of a mirror. This went on the outside of the receptacle and then the bulb was screwed in the socket. This would reflect the large light and the colors on the shiny form. Those bulbs were circa 1950’s. The next bulbs I remember were the bubble lights, which were shaped like little candles. There was a small base and the thin shaped tube with colored liquid inside, it bubbled when the liquid got warm. I liked them they appeared festive on the tree. Next was the tinsel which covered the whole tree, at first they were metallic but later they are now made of plastic or some derivative of some petro chemical. In the 60’s an aluminum tree arrived with solid colored balls and a revolving light with four colors, yellow, blue, green and red. That lasted a few years and then the final tree was an artificial green and we went back to the antique balls and little twinkle lights. My father was a pack rate and never threw anything out, but after he died and we were cleaning the attic we never found any of the decorations, lights or aluminum tree. My sibs and I decided he threw away anything that would have been of value and we could have sold on eBAy. I have been watching the postings from SNGF and the facial recognition software. I spend a lot of time taking pictures and realized I have very few of myself. I tried to do it with a picture of my sisters and I, but it only did one of my sisters. It will take a lot of searching to find one suitable for that project. Maybe I can do one with how I looked as a child. I have been reading many more blogs by hitting the "Next Blog" option. It seems when I hit the next from my blog it takes me to blogs where people posted pictures of their children. I guess it recognized children and not the Genealogy title. If I hit Next Blog from some of the other blogs I go to other Genealogy Blogs. I have yet to figure it out. When I visited with my brother Bill at the beginning of November I had told him about the work on the Family Tree. He had requested that I would mail him my finds. I had to go and update a lot of information on both my husbands and my tree, honestly it took the better of two hours. Now I feel that I should do this on a more timely basis. I tried to upload a new tree from my Family Tree software, and the information said it had gone but it did not come up......I hope my relatives aren't floating out there in cyber space. I made the copies and backed up what I had updated. I just need to transfer the update to my flash drive. On his way back home about 7 PM he said that people were camped out in front of Best Buy, one even had a pop up tent. Wonder where the Port O Potty was located. I have yet to find anything in my world that I would stand out in the cold weather and sleep in a tent waiting for the store to open. It is now snowing outside, I think it is too warm for it to stick on the roads or driveways, but the leaves are covered. I am trying to write in my Blogs on a daily basis, my worry (not loosing any sleep over it though) is what will I write about every day?? Guess I will come up with something. Just sitting here perusing the Internet because I am not cooking dinner today. Last year I had Thanksgiving at our house with all the family. I think Thanksgiving is my favorite holiday, it is not religion specific and anyone can celebrate. When I was a child I started wondering what I would be doing next Thanksgiving. I have had the same thought ever since. Sometimes I have been really surprised. The first time that stands out is we were in Pennsylvania eating at one of our parents and a year later we were living in Korea. My husbands job had taken us there. I do remember my friend Ruth hosted the dinner, sorry Ruth I don't remember the menu. Finding western foods in an Asian country was quite challenge. They had the black market where you could find anything at a price. Things like baked beans, cranberry sauce, peanut butter and any other things that were not on the Koreas diet. I can imagine how much different it is there now. The next time, it was 1977 I think. We were in Yugoslavia and we ate our dinner in a castle. There were two choices to dinner, I remember that half of the diners got sick, and it was a food borne illness. I did not get sick, but I just can't remember what was the culprit at that meal. The castle was now a restaurant and the wall were covered with tapestry. There were all sort of castles in Europe, the built them on the top of hills and now they are in ruins, hotels or bed and breakfasts, or museums. I have to dig out my old photos and scan them. I will make that a project for the new year, I do not think it warrants a resolution. Today we are going to my brother Richard's five of the six live in Western PA. My other brother in VA could not make it because his wife and daughter have to work at sometime this weekend. My contribution is going to be the vegetables, which is better than my sister Shawnna, who is going to peal and cook 10 pounds of potatoes. Sounds like a prison job to me. I should not have said that, it may be my job next year. I called Aunt Edna and she was so surprised, she had never heard from her Mother in law (Mary Stephens) that her mother Olive had remarried. I mailed Aunt Edna the documentation and she called me and said it was really her mother in laws family, and Mary had NEVER mentioned that fact. She was going to call a great granddaughter of Mary Stephens sister Irene to see if she knew anything. Edna said she had not talked to Stella in a few years and she hoped she had remembered. I hope so too, I told Edna that Mary Stephens sure could keep a secret. This was the first tombstone picture I had. It is of my great grandmother Maria Ann Johanna Korbach Bartels. She was born in Jena, Germany. I had enlarged the light gray stone, but still could not make out the dates. I think she may have been living in Bremerhaven, which is o the North Sea. I would like to find out exactly where it is located and if my great grandfather is buried there too. Today, I called Aunt Edna and told her what I had found about Olive Bauser Stephens Rauhut. I mentioned that I found Olive in Salem OH but under her new married name. Aunt Edna was really surprised, she never knew that Olive had married again. Olive is buried in Grandview Cemetery, I have to find if she has a stone.....And, where is Oswald buried? So far, I have not found any children by this union. Olive and Oswald were both about 39 when they married, so this possibility does exist. Then I mention on Oswald Rauhut immigration papers which I found in the Western District of Pennsylvania, it had listed the step children of the Stephens. Aunt Edna said her mother in law, Mary Stephens, had talked about her mother Olive, but NEVER mentioned her remarrying and having a step father.................Neither my husband or his brother remembered their grandmother taking about it either. Do I sense a scandal brewing, or was it just something that Mary wanted to forget?? I may never know. I thought all had been discovered (I REALLY should have known better with that thought) about Olive Bauser Stephens. But, I WAS WRONG. I subscribe to the PA Allegheny County Roots Web and they are the greatest and best bunch of fellow genealogist I have come across. I had posted another query about Olive Stephen trying to find her in a census record and the name of her parents, of which I was having zero luck. I mention what I knew about Olive, DOB, died on Christmas Eve in Ohio, and the newly found maiden name Bauser. A very kind woman on that Roots Web list send me a copy of an Ohio death certificate she had found. It listed a Olive Rauhut, with husband Oswald and date of death as 24 December 1923. Her father was Jacob Bowser and mother Mary UNK. I was really surprised. Then I did a search on Ancestry for Oswald and came up with the family in Missouri in 1900 and Pittsburgh in 1910. They had lived in the same community, so now it explained where they had met, and I had been suspecting they met in Ohio. But the biggest surprise was his application for Naturalization and it listed Olive as his wife and the four Stephens children (including grandmother Mary) as step children. Never once did I ever hear Mary mention she had a step father…I asked Chuck and he said he never remembered his grandmother talking about her side of the family at all. So it seems that they got married in 1913, the year that Robert had died. Did a lot of women remarry because they had no means of supporting themselves and their children? I was really surprised with this turn of events. I have to give Aunt Edna a call. GOING THRU PAPERS RECENTLY FOUND. I have been going thru the papers recently found in my father in laws metal strong box. He had a lot (90%) of receipts dealing with health insurance and regular insurance. That really does not have any significance, at least not at this time as far as I can determine. However, it did have about four deeds and one was from the thirty's. On the dead it listed the distribution of land that was owned by Anton Sperl and Katharina Rauscher Sperl Nosseck. It also have the funeral expense listing for Katharina, her funeral cost about $350 in 1947. The interesting thing was I have two little girls who Aunt Edna called Big Margaret and Little Margaret. I have been trying to figure out who these two Margarets were. MY THEORY is now that question has been solved. One Margaret was the daughter of Antons daughter Barbara Sperl Stich and the second Margaret was the daughter of Antons son Charles (Carl) Sperl. Charles died in 1918, in a Railway accident, and Barbara died in 1926. I do not know what caused her death. I guess it is time to send for the record. Another sibling mention in the deed was their brother Joseph who died in 1920, This must had been unexpected, I found him the the 1920 census and he was employed and I found his WWI selective service record and no mention of being differed. The strange part is that they were all in their twenties when they died. Sending for the records can be done now since I have the time of death. TWO MARGARETS. One Margaret married a man names Ulrich and the other Margaret married Harry Sumner. More to investigate on that. 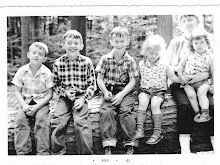 Today I am going to scan what I found and send it to my cousin Julie who is also researching this family. Finding things like this is like Christmas Day for me. Sometimes the answer is in your basement. For the past who knows how long, I have been looking for Olive Stephens maiden name. I had mention to Chuck (pictured below) my angst in finding her name. He mentioned that his dad had a metal box with some papers. He remembered it from 1996 when Joseph had died and it was somewhere in our basement. Today he found it and as I was going through mostly nothing important I came upon a copy of the Baptismal certificate of his grandmother Mary Irene Stephens. There, listed was mother, was Olive Bauser. Then Chuck decided that the Bauser name was familiar because he remembered in the family there was a Hauser and a Bauser. He just did not know who the Bauser person was. Yesterday I found the WWI draft card for Olive and Roberts first child, James. It was dated 1917 and it had listed next of kin as his mother. There was not name but as of 1917 Olive was still living. Things also in the metal box. 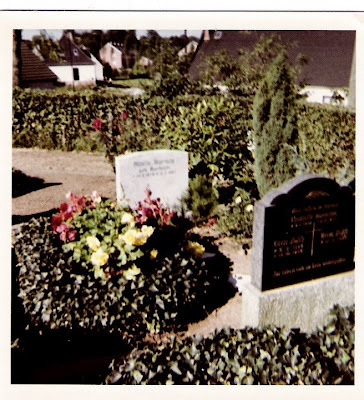 Pictures of the family, deeds, mortgage papers, and a list of the funeral expenses from his great grandmother Katharina Rauscher Sperl Nosseck. I have to copy them and send them to my cousin Julie in New England. Katharina was her great grandmother too. In honor of Veterans Day I would like to add this picture of the cute guy who caught my eye forty one years ago. I have spent the past week at an educational meeting in Williamsburg VA. Two good points of the meeting are number one: it goes from 6:30 AM to about 12:30 and I have what is left of the afternoon to go out and about and explore the region. Two: I got to visit my brother and his family. He has lived in the Tidewater are since he graduated from college, I guess about 25 or 30 years ago???? I will have to ask him….He and his wife were interested in what I have uncovered. Tamara said that her mother had done some of her family genealogy but she has not looked at it for some time. I offered to send her some forms and see if I can get her on her way for researching her side of the family. Her mother grew up in WV and her father in TX. I told Bill I would send him what I have found but I am wondering what is the best format to send it to him. I could send him a GEDCOM, but he would not have a clue about it….. This requires some deciding on my part. What would be the easiest for a non genealogist and also easies to understand??? I have been searching for Olive Stephens still. I came upon a list of COLUMBIANA COUNTY CEMETERIES to search. Goodness there were too many to even count and only one has a web site. I think I will use the assistance of Google. I did not find Olive and Robert Stephens marriage record on the microfilm at the Carnegie Library Main in Oakland (Pittsburgh PA) A kind person on the Allegheny County Roots Web told me he would look up for a listing the next time he went into town. I thought perhaps that they eloped because of their age difference (25 years) so another Roots Web Member sent me the marriage list of West Virginia, they were not there. I suppose now I should search Maryland or just take a break. To complicate my brain, I received a note from the Salem OH Historical Society and they did not find the burial site, but they DID find a burial for Edward Scheuring in Grandview Cemetery. Was this Olives daughter Irene's father in law?? A kind soul on the rootsweb list send the link for the Ohio deaths and certificates which are online on Family Search. I searched all of the deaths and still did not find her. I did find one Olive (b1872 in Ohio) but she died in 1944 and had a spouse John. Unless John Stephens is Roberts Stephens brother, I do not think this is it. But then again who knows? Perhaps, Olive did not die in OH and if she did where is she now? I am about to give up on this one for a while....My Olive was born in PA according to many of the census reports. I took a trip to the Phipps Conservatory yesterday, my aim was to take pictures of the Fall Flower show. I was disappointed because there weren’t too many fall flowers. But I did walk around taking pictures. The one above gave me a thought. Not the glass clowns, but the date on the brick was behind. It say 1892, it started me thinking. I wondered if my ancestors came here to enjoy the flower 107 years ago???? PHIPPS CONSERVATORY This link shows some of the Conservatory but not too much in the way of history. Guess I will have to search deeper for that information. The next show will be Christmas and it will be spectacular with the flowers and colors of the season. Olive Stephens still eludes me, I posted a question of Roots Web and someone sent me the link for WV marriages, seems they have an index that you can peruse. With the twenty five year difference in their ages I feel fairly certain that Robert Stephens and Olive eloped. Today the daughter and I took a fall foilage day trip to Salem Ohio. It only took 1 1/2 hours from my home. Salem is a small heart land town, it looks like it would be a nice place to live; they have a hosptial as well. I spent time at the library. First I looked in the city directories, but they only had a few years that I was looking for. Then the research librarian looked in the index for Grandview Cemetery and no Olive Stephens. There is another cemetery and Emily and I drove there and even though the door was unlocked and open no one was there. I did get the phone number and will give them a call at some point in time. We did stop and buy a pumpkin, which Emily is going to carve. The gas in Ohio was about 15 cents less per gallon that in Pittsburgh. I did fill up the car, that was the second thing I bought in Ohio. Now back to the drawing board for my elusive Olive. My next thought is should I be putting tags or labels on these postings.? I suppose I will now have to search for that box, I guess it is in the basement somewhere. If I find it the Olive mystery will be solved. I also found out that the Carnegie Library of Pittsburgh has copies of the City Directories from 1815, The Stephens family was in Allegheny City (now part of Pittsburgh) in the 1870 census. I guess next Saturday I will take a trip into the city to search this index. I will also have to scour the cellar for that elusive being metal box. I work in a hospital and come across many people. On Wednesday I noticed a man, with the same last name as my great grandmother, was on the OR schedule. I asked him if he was from the town in PA that my Bridget was from. He said yes, we had talked a bit and today I went to visit him again. On Thursday I had checked Ancestry and found four other men in the town with the same last name. They were all born within two years of each other. MY THEORY and NEW COUSIN and I agree, we think that our great grandparents were probably siblings. I also talked to his daughter and I will be sending her some of my information. What a nice family, even if we are not related......Just goes to show you that you can meet family in the most unlikely places. The problem with following female relatives is that they can get lost or you not know they were there at all. The only record I have in the census for Bridget is under her married name. She also had a twin sister, whom my dad said he could not tell them apart. I found a Margaret Naughton who was sponsor for one of Bridget and Thomas children. I think this might be THE TWIN SISTER and she married soon after that. If my dad remembers them she would have been alive in the 1920' and 1930's. More on this development to follow. Are these the same women in the two photos? I am now back to searching for Olive Stephens. MY THEORY is that she died sometime between her husband Roberts death (1913) and 1920. Aunt Edna said she on Christmas Eve in Salem OH and was buried there. I have been looking at a family of Stephens who emigrated in 1850 from England. They had a son Robert born in 1845. In 1860 I found them living in "Development 1, Henry KY" I did not find the in 1870, still searching for them in 1870. But, low and behold, I found them living in Allegheny City (1880), which is now the North Side of Pittsburgh, across the Allegheny River. Allegheny City was annexed in 1908, much to the displeasure of the inhabitants. This leads me to believe that this is where Robert stayed. Robert had joined the Union and fought in the Civil War, even though he would have been 14 or 16 at that time. He was listed in a unit that was formed in Western PA, so had they moved north about the time of the Civil War? I have found a Civil War Pension and he is buried in the GAR Plot of Uniondale Cemetery. Which is located on the North Side of Pittsburgh. That leads me to believe that the Stephens I have been following are "MY" Stephens. What problem I have been having is I am also finding the name spelled as Stevens. In the 1900 census I have Olive and Robert living on the North Side along with their four children (Including Mary, my husbands grandmother). Also listed is his brother James, who was also with the family in 1880. Now, are the parents (Charles and Hanna Stephens) buried in Uniondale. I have to check when that cemetery opened. There is also Allegheny Cemetery, which opened earlier in the 19th century. I can not find a marriage license application for Robert and Olive, even though they were married in 1891. Because of the difference in their ages (he was 25 years older than Olive) did they elope? He was single in 1880 and married two times by 1891. I looked in Ancestry and found about 5 Olives living on the North Side in 1880. Could one of them be the elusive Olive? I contacted the Ohio Genealogical Society to see if they had any ideas on the subject. In 1920 their daughter Irene was living in Salem OH. Maybe a trip to Salem OH is REALLY in order. I am hoping that the library may have the records I need. It is really not too far of a drive, about one hour. What is my most satisfying genealogical moment? Since I have been searching the family tree for only a few (2/ 1/2) years I don’t have a plethora of things from which to choose. My sister and I went to take pictures of my grandparents grave. Anna and Willi are my grandparents. Willi died in 1936 and Anna remarried. To find the grave I had to stop at the office and they gave me the map and information. With a second thought in mind I inquired about Anna brother August Bartels, who I thought might be buried there too. To my surprise I found August and he was buried in a plot with many others. Now, who were these people. I surmised they were related, but how? I found August wife, my Tante Lotte. I had no idea her name was Charlotte. I remember her from childhood. That was a great find, but the story thickens. 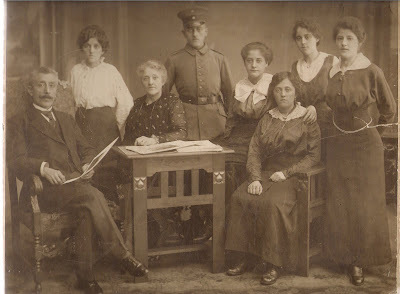 Here was Alwine and Charles Dietrich, Emma and Hermann Schwab, Ella Bartels and Minna Bartels. This REALLY screamed more research. I deduced that they were born too early to be my Grandmothers siblings, I knew there were four of them and her youngest sister was born in 1913 and August in 1902. I needed a stop at the office and they I found August listed as nephew. Home we went and then searching the records for the women. What I found was astonishing to me !!!!! Ella Bartels, sister in law of Charles Dietrich. Minna Bartels sister of Mrs. Schwab. These unknown Bartels were siblings of my Great Grandfather, Daniel Bartels. They were my grandmothers Aunts and I never knew they were here. I suppose since they died before I was born, it never came up in conversation. Olive Stephens birth certificate came today and it was not MY Olive. The Olive who had died was a 6 month old girl. I was disappointed with that document, but REALLY impressed with the operation of the Ohio Historical Society. Soooo, back to the drawing boards, so to speak. Now the question is where is Olive Stephens buried. I have to go with Aunt Edna's statement telling me that she died and was buried in Salem Ohio. Then I need to explore the fact Edna stated she died on Christmas Eve. Maybe a trip to Ohio in really in my future. I have to do some preliminaries first and reread my email concerning Ohio. 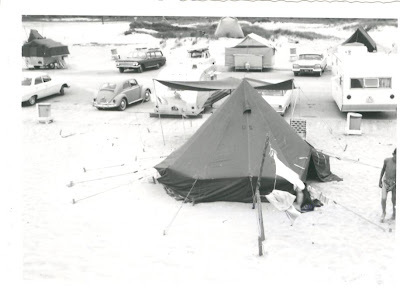 We took off in the '57 Chevy and my dad drove to NC, the Outer Banks to be exact. This was the days of Pre Interstates. Actually, I have no clue how we got there, but, I suspect it involved in driving around Washington DC and south on Route One. I am not sure, but I think that may be the one. At that time we had to drive through every one horse town from PA to NC. What I remember mostly was a two lane road from Virgina down through the rural south. We passed many small farms, the houses were dilapidated and run down. The dwellings were farms and the farms were behind them. It was the type of places that had furniture and washing machines on the front porches. These people were poor and trying to eke out an existence growing tobacco. Upon our arrival there were very few houses to rent and a lot of the "Old' style beach cottages, which were weathered, dark grey and had large green hurricane shutters that would lower and cover the entire windows. Air conditioning was non existant. Very few motel/hotel existed, and the ones that did catered to fishermen. A campsite was found at Oregon Intlet, and the nomad style tent was pitched. I do not remember the exact sleeping arrangements but I think the girls slept in the car. 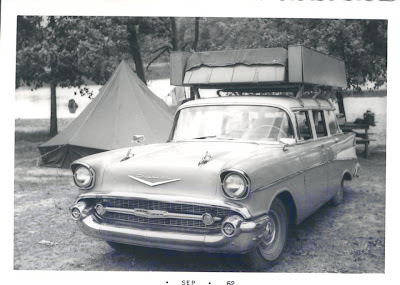 My father had devised window screens to fit the car and he had two level sleeping quarters in the back of the wagon. The boys slept in the tent. Over the back of the wagon was installed a mosquito net to keep the insect at bay. There was one little grocery store and we would buy the provisions for the next days. One of the highlight of the week would to go to the fishing pier in the afternoon and watch the fishing boats come in and the men would have their pictures taken with their catch of the day. During the day time we would go on little jaunts to explore the islands. From Oregon Inlet to Hatteras Island a ferry was taken, then another ferry went from Hatteras Island to the furthermost island where Ocracoke was located. Some plans had been made to junk the first ferry and a grandiose bridge was planned and built. It was almost finished when some hurricane (who remembers the name it had) came along and changed the shore line and most of the bridge now covered dry land. The bridge was finished and now you can drive along most of the coast. I am smitten by the Ohio Historical Society. A few weeks ago I had written about trying to obtain a death certificate of Olive Stephens. I found the name on their online index and electronically order the death certificate. They had stated that it may take up to a month to have it processed. Yesterday they send me an email to tell me it was on its way. Did it take a few days because it was in their data base? Or, are they usually so prompt. I hope it contains the information I seek, which is mainly Olives maiden name, and if I am really Lucky the names of her parents. Olive is my husbands great grandmother and she is buried in Ohio and her husband was buried in Pittsburgh. My theory was that he had died in Pittsburgh and Olive moved to Ohio to stay with her daughter Irene. Robert, he husband was buried in the Civil War Plot in Uniondale Cemetery in Pittsburgh. Another mystery to solve and I do not know yet how to go about finding the answer….. Robert was married before, which was indicated on the census. The census was 1910 and found on Ancestry. Olive and Robert were living on the North Side section of Pittsburgh PA.
New questions to ponder. Who was the first wife? Where did Olive and Robert meet? Are there any descendants from the first marriage? I did not find their marriage application in Allegheny County PA.
Robert was born in England (1845) and I found a (hopefully) matching entry of emigration . It had listed on one census that he emigrated in 1850 and in the 1910 census it had listed a brother James (b. Kentucky). I found the Family listed on the above on a census record of 1860 living in Kentucky but there was a Hiram, not James but the DOB’s match. Guess I need to find a historical society in Kentucky. Each answer begets ten new questions…. Not the smoke able kind….. I read a posting on GeneaBloggers and it told me to please enable referrers in your browser. What in the world is a referrer??? From the message I think it is a way to avoid spam. I have not been getting many comments and is there something going on of which I a unaware concerning this referrer business? I liked the idea of leaving a contact email because it is my hope and or fantasy to hear from some one who is related and lives in Europe. Last weekend, while I was driving home from the German Writing and Record Conference I had to go by FRICK PARK. Pittsburgh has a city center and then many communities outside of the center. I must have been about three going on four and I remember my parents took me to the park. It was exciting because my mom brought peanuts to feed the squirrels. There were red and grey squirrels and they did enjoy the peanuts. My father decided (?????) to place his thumb between his index and middle finger and put his hand down to the squirrel. The squirrel bit his thumb, that incident served as an example of what not to do. Looking at it as an adult I think he was lucky that the squirrel did not have rabies……The picture below was taken that day at Frick Park. Most likely before the squirrel teasing and biting caper. Believe it or not, this morning I sent for my first death certifcate. While out with my husbands Aunt Edna she said that Olive Stephens (great grandmother in law of mine) had died in Ohio. That was before I knew the woman's name was Olive. I live in Pennsylvania, and to obtain a death certificate in this state requires many hurdles to jump through. The great and powerful and also antiquated bureaucracy does not have an online index from which you can search and then order certificates. They cite privacy issues, I think it is more like they do not want to spend the time and money on the index. They started recording of vital statistics in 1906 or there about and getting them it is still tighter than a drum. You have to fill out a form, include a picture of your drivers license and mail the check to New Castle. I guess I could drive to New Castle but I doubt that I could search the index myself. I personally would just get frustrated with the hassle I know would be coming. Now, on to Ohio. I found the index, which is managed by the Ohio Historical Society and ordered it and paid by credit card. They did not ask me anything about drivers license, but they were going to send me driving direction if I wanted to go to Ohio. The Ohio line is about 74 miles from where I live. The certificate cost $7.00, it would cost me more than that to fill my tank, but a road trip to Ohio would be nice. I want to find, the maiden name of Olive, where she is buried and possibly a picture of her grave. Her death must have been sudden because Aunt Edna mention they got a call one evening that she had died. Aunt Edna said it was on Christmas Eve, but according to the record it was the eve of the Fourth of July. I guess a holiday eve was in the mix after all. Ohio, I love your ease of access to get these records. I have to admit that the class of German records and writing was GREAT. This is actually the first class I have attended so I hope I am not dissapointed with any others. We really did not go over Fraktur, but rather he showed us the type when used in a lecture of American German Newspapers. I can read the small letters but the capital letter will take some getting used to. Donna, I tried to leave a comment and it kept telling me to leave a valid email address and I had but it still would not publish. I have photo editing software and I did not know about the print/alt button. Guess it was one of those things on the keyboard that I never paid any attention too. There are a few others that I am clueless about. I will have to play with it and see what I can do. Thanks for your help. The teacher, John T Humphrey CG was very informative and held my interest for the two days. He included a bit of German and American History which gave us insight to the conditions of the time and why our ancestors left. I was glad I took the class, now I have to act on his information. This weekend I am attending a two day class on reading German Script. It is proving to be great. What we covered is Sutterlin and Kurrent. We can now read the letters when printed with much accuracy but, as with any cursive writing, it is difficult with the variations of penmanship. Tomorrow we will learn Fraktur. My Mutti had a Fairy Tale Book written in Fraktur, so perhaps I can read it, or at least identify what is written. What I found on reading some of the old Church records is that there is a combination of styles in some of the records. Some of the letters are Roman Script and some German Script. The Roman letters are no problem. After this class I (hopefully) will be able to read the old records, or at least give it a shot. Since my last entry I posed my question to the PA ALLEGHENY COUNTY ROOTS WEB and a kind soul, Larry found them in the 1910 census. Why I was wrong, John was listed as Robert. I do not know if he went by Robert or John, or John was someone else and I was chasing a wild goose with that name. Anyway this is a great discovery. His wifes name was Olive. Olive and Robert were married in 1891. It appears that Robert was twenty five years older than Olive. There were four children listed, James b. 1894, Irene b. 1896, Mary 1900 (my grandmother in law) and Leonard b. 1903. The surprising thing was that I had not known about Leonard. And on the 1900 census I also found them but the name was spelled Stevens instead of Stephens. 1900 listed the immigration year as 1862 and also in living with them was a brother James Stephens who was born in Kentucky. Another person (Bev) on the Roots Web list had given suggestions on many sources to search and a third (Donna) suggested to contact the Genealogy Department of Salem OH, which is in Columbiana OH. That is close to Pittsburgh, so I think a day trip may be in order. Donna said that the library in Salem has a large Genealogy Department. These ancestors are proving easy to find if you only know their names and where they live. Did you ever come to a mystery that you can't solve? I am still looking for the Stephens Family in Allegheny County PA. My grandmother in law, Mary Stephens was born April 1900. Her sister Irene was born about 1896. There was also a brother and I do not know when he was born or when he died. They lived in Allegheny County PA, I can find Mary And Irene after in the 1920 and 1930, after they both had married, so why can I not find them earlier? This is proving to be a challenge, I guess I will have to pose the question on the Allegheny County Roots Web list. They are a great group of people who seem to be able to solve problems and help everyone. This mystery is making me a little crazy, I do not think it is a brick wall, just a load of bricks on my pathway. John and Mary wedding photo, 1918 and sister Irene and Johns brother standing. Do not know which one, it is either Charles or Joseph. I will have to ask Aunt Edna.